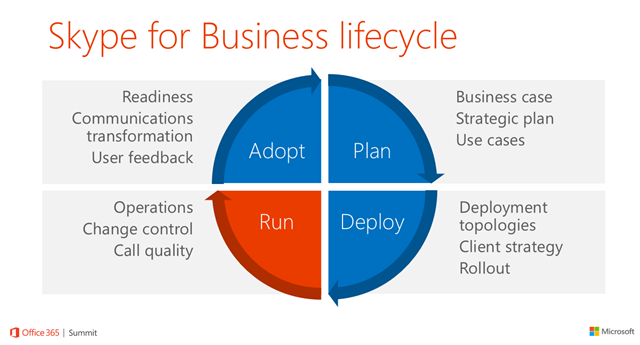 lifecycle of Skype4B start with planning then deploying, run it and administrate it and “DOES NOT” end at adoption. Skype4B still support Resource Forest / user forest as well as Resource Forest / Multiuser forest but the later one is not recommended by Microsoft. when moving to Skype4B (n-2) role still applies, which mean it is possible to move to Skype4B from Lync 2010 and Lync 2013 but not from OCS 2007 R2. moving to Skype4B while having co-existence Lync 2010/2013 is not Supported, doable but will produce unstable and buggy deployment. Side by side migration is still possible, although i don’t see why would you think of that? Lync 2013 / 2010 clients would be able to connect to Skype4B frontends. Skype4B / Lync team tired approaching Cisco to make a solution for integrating Skype4B with legacy VTC but Cisco as always “too cool for school” and didn’t help so Microsoft introduced new server role “VIS” Video Interoperability Server. VIS will be included already in the licenses, no extra costs or hidden fees. VIS terminate the connection at one system and then connect to the other system. Need VTC running TC7.0.0 or above, some releases need to be validated after the release of Skype4b RTM. no in-place upgrade from Lync 2010 to Skype4B, will have to use Co-existence way to migrate. move users from Pool-1 to Pool-2, do the in-place upgrade on the servers in Pool-1, then move the users back to Pool-1. move users to Pool-1 again, upgrade pool-2. when moving from Lync 2010 to Skype4B, build a new Skype4B infrastructure, carry on with the Co-existence scenario,as in test, move users, move CMS then decommission Legacy Lync 2010.
if you have Co-existence between Lync 2010 & Lync 2013, you should move to purely Lync 2013 then make in-place upgrade to Skype4B, as mentioned before you can do the movement to Skype4B while having Co-existence but it will produce problems and bugs and you cannot complain to Microsoft. this will be needed like when migrating from single Standard edition pool for example. you won’t have to migrate users to other pool. ve to upgrade the SQL first (require downtime) then run the in-place upgrade which will upgrade it to SQL 2014. Already existing integration with Exchange should not be affected. Invoke-CsFailover is used when patching the servers, it take care of checking the health status of the servers as well as draining the services before stopping them. scheduled conference has now longer expiring date for better handling of expired dates. Only available on-primes, not available for Skype4B online. Outlook add-on will always automatically fixes problem with meeting by checking them, and the expiration time for scheduled meetings is extended by 1 year. While uploading a presentation, no message will appear to other participants until the upload is done and ppt is approved. The Microsoft Surface hub does not mean that LRS is no more, the LRS still going to be produced. Surface Hub is different from LRS, different requirements, different user base. Azure media services using webRTC and no plug-in – coming soon allowing 1000+ participants in same meeting. 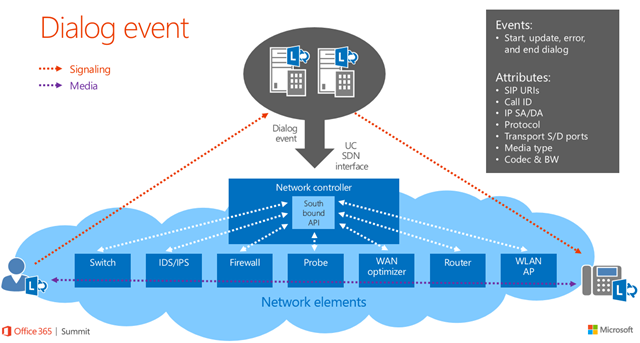 Application that can be installed on Lync serer “LDL” send the information to the SDN manager pool about the subnet which is forwarded then to the Controllers, which then decide what to do to make the network better. Cisco were also “Too cool for school” and decided to go with another way with SDN and use programming languages like Java instead of the open standard protocols. so here you go, that was my notes from Microsoft Office 365 Summit in Amsterdam hope you found them useful and stay tuned for more news about Skype for Business. Thank you for this. Was there any mention made of API support such as UCMA with Skype4B? im sure there was in the Developer sessions but i didnt attend those as i am not a developer. i will recommend downloading the ppt files from the developer sessions from the summit website and check them out. God Bless You My Friend..You are Amazing..